A game-changing solution that offers an innovative approach to dealing with the new application, security and scalability demands in a compact form factor for flexible deployment. Combines a modern, fully programmable OS with leading performance and incorporates the industry-first Network Analytics Engine to monitor and troubleshoot network, system, application and security related issues easily. By enabling faster automation and delivering network insights, ArubaOS-CX reduces the time spent on manual tasks and addresses current and future demands driven by Mobility and IoT. Aruba Network Analytics Engine provides the ability to monitor and troubleshoot the network through simple scripts. Monitoring, analytics and troubleshooting tools are built-in, extensible and deliver historical analysis to help solve problems faster. With a built-in Python interpreter and a full set of REST-based APIs that allow easy integration to other devices on-prem or in the cloud. Provides 2.5Tbps for switching and 1,905MPPS for forwarding. All switching and routing are wire-speed to meet the demands of bandwidth-intensive applications today and in the future. 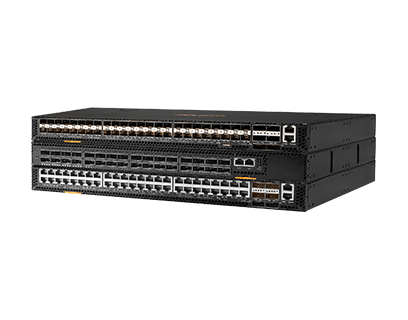 Choice of compact 1U switches include model with 32 ports of 40GbE and models with 48 ports of 10GbE (SFP/SFP+ and 10GBASE-T) and 6 ports of 40GbE. 40GbE ports support QSFP+ transceivers. 5-year WarrantySee www.hpe.com/networking/warrantysummary for warranty and support information included with your product purchase. Software releasesTo find software for your product, refer to www.hpe.com/networking/support; for details on the software releases available with your product purchase, refer to www.hpe.com/networking/warrantysummary. DocumentationFor documentation including manuals for your product, refer to www.hpe.com/networking/library. For additional specifications, please see the data sheet.